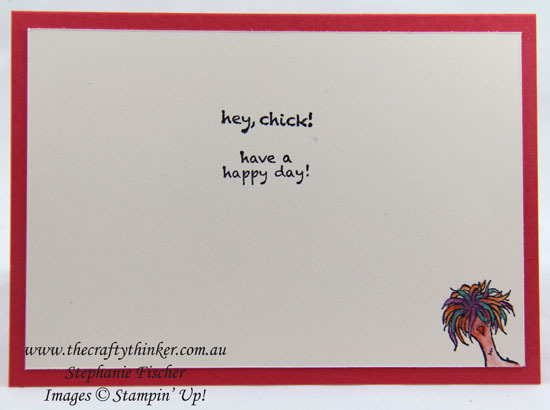 This card was inspired by the Global Design Project sketch challenge this week #GDP070. No ducks, but the eggs are almost lined up in a row! It's a very straight forward card. 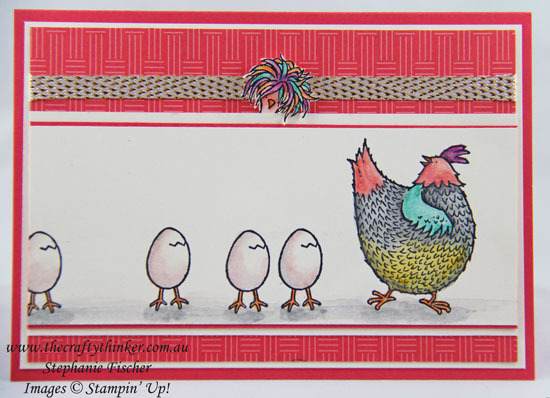 I stamped the images from the free Sale-A-Bration stamp set Hey, Chick onto Very Vanilla cardstock and coloured them with watercolour pencils and an aqua painter. I mounted the stamped strip onto a slightly larger piece of Watermelon Wonder cardstock and then another piece of Very Vanilla (this time I didn't place it evenly - I left a wider border at the top). 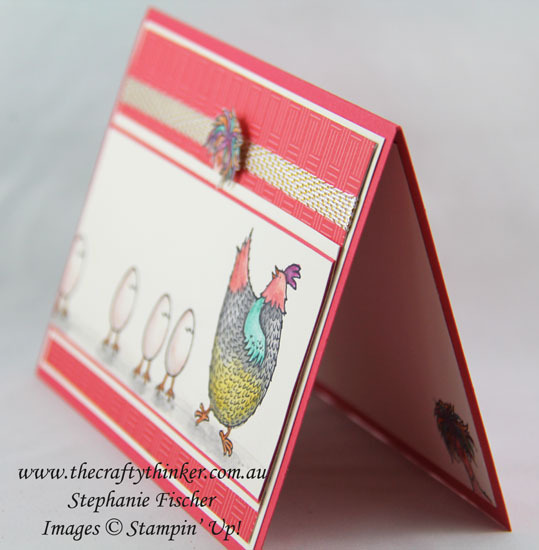 I added the fussy cut "stickybeak" before adhering the panel to the piece of paper from the Carried Away Designer Series Paper pack. Naturally, the stickybeak makes a appearance inside the card too! The peeking chicken is adhered with a piece of dimension so that it sticks forward from the panel. At this point in writing this blog post I'm wondering whether "stickybeak" is a term used anywhere outside of Australia! If not - it can be translated as "nosey-parker"! I'm really having fun with this stamp set - I'm still pinching myself that it was a freebie! In fact, the ribbon and the pack of printed paper were also freebies! For more information on Sale-A-Bration freebies, click the here.